February is upon us: this weekend marks the beginning of the descent into the spring semester, not to mention the slow climb out of winter. More importantly, the world no longer has to wait with bated breath for its favorite woodland-critter-themed holiday. And what better way to ring in the festivities than with what is perhaps the greatest film ever made about a groundhog? 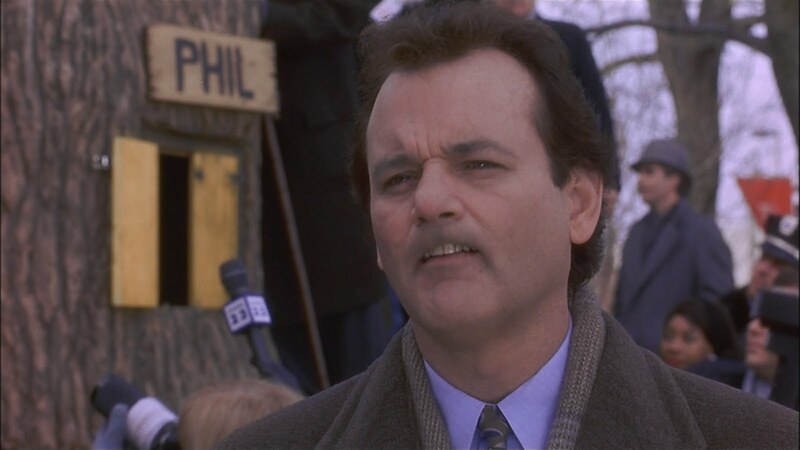 Groundhog Day (1993)pairs director Harold Ramis and Bill Murray, who had previously worked together on comedies such as Caddyshack (1980), Stripes (1981), and Ghostbusters (1984). Groundhog Day, however, finds the pair at their most compelling and, surprisingly, most profound. Murray stars as Phil Connors, an embittered TV weatherman sent to Punxsutawney, PA to cover the Groundhog Day festivities. After a blizzard traps the news crew in the sleepy town, Connors is trapped in a time loop, doomed to repeat February 2nd over and over again. Though the plot borders on trite (think A Christmas Carol meets February), Ramis and co-writer Danny Rubin bring a freshness and keen comic sensibility to the film. The pair devises countless renderings of the same day, creating a logical progression of Connors’ psyche as he goes from hedonistic and whimsical to darkly suicidal. The role fits Bill Murray to a T, allowing him to portray every facet of his personality, whether it be deeply sarcastic or sympathetic, and the actor manages to seamlessly connect his deadpan delivery with his character’s complex self-reflection. Like Murray’s performance, Groundhog Day is absurd, dark, hilarious, and heartwarming all at once. Although the film is by and large a romantic comedy, it’s surprisingly affecting, not to mention more substantive than most movies of its ilk. Through its well-conceived screenplay and strong performances, Groundhog Day reminds us why Hollywood comedies can be a pleasure to watch. Groundhog Day is available to rent on Amazon Instant Video. Written by: Julia Selinger on February 2, 2013.